The Celtic midfielder says he believes a yellow card for celebrating in front of Rangers' El-Hadji Diouf was worth the punishment. The Celtic midfielder was involved in a running battle with the on-loan forward in Sunday’s Old Firm derby, which finished 2-2 after Brown levelled the scores with a curling effort from outside the area. 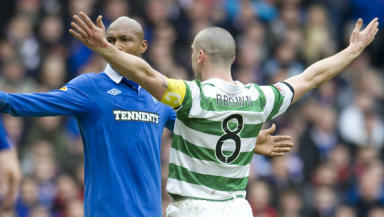 Brown celebrated in Diouf’s face after his equalising goal but the Celtic captain says he believes it was justified, claiming the Rangers forward had picked on the wrong player. “The celebration was brilliant and I don't regret it in the slightest,” Brown told the Daily Record. “It was the best booking I've had in my life. “He wanted to drag me into a battle and I was quite happy to oblige him. I think I came out of it on top and he knows it. In the aftermath of Sunday’s game, Diouf accused Brown of trying to get him sent off after a number of flashpoints, with the Senegalese forward accusing his Celtic counterpart of trying to taunt him into retaliating. “I wasn't trying to make him snap or get him sent off,” Brown countered. “It was all just a bit of banter as far as I was concerned.